Having become such an integral part of our daily lives, mobile phones need to be more compact, fashionable and practical than ever before. traditional mobile phone antennas, making them ideal for compact phones. INVAX internal antennas are a rugged and durable solution for compact cell phones. They are encased within the housing of the wireless device for extra protection and aesthetic appeal. They provide exceptional performance and can be equipped for single, dual or tri-band receivers. INVAX R&D team with the fastest concept to production times in the industry. 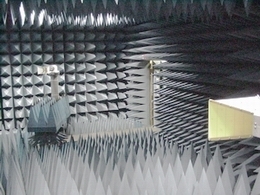 INVAX set one fully 3D Anechoic Chamber with dimension 8m x 4m x 4m.They can test 2D and Full 3D Antenna Radiation pattern at from 100-6000 MHz, and provide CTIA OTA test solution for mobile phone antenna. The test data of TRP, TIS, 3D antenna gain and antenna radiation efficiency, let the design more reliable.